Posts Tagged "Bridal Book Renaissance"
Home » Posts Tagged "Bridal Book Renaissance"
A glorious bridal look by Jorge Luis, large photo, was created with two ponytails, one placed high, one lower, backbrushed for a polished look on the sides. He then gathered the two, sprayed, and added white flowers on the lower side. 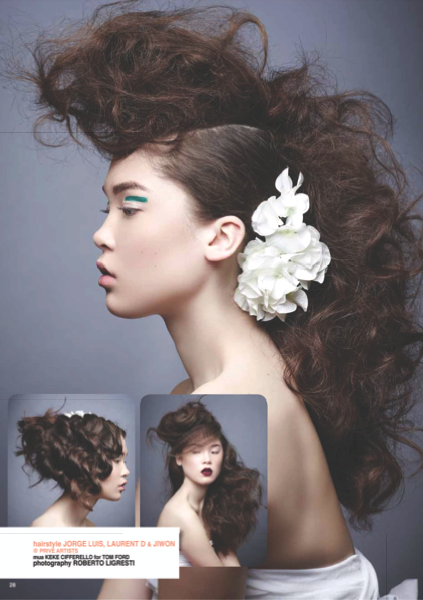 Bottom Left: A “faux bob” with an amazing architectural finish by Jiwon, Privé, Laurent D Salon with curls manipulated into finger waves, a white flower not showing on the other side. Bottom Right: Laurent D’s half up, half down beauty was backcombed to one side for a casual effect, a small section crimped at the front to simulate a veil. Keke Cifferello’s makeup for Tom Ford included a stark streak of glittered green over the eye and, bottom right, Velvet Cherry Lipstick. As published in The Brides Book Renaissance by Peluquerias Hairstyles, 2o17.